UNAFEI contributes to the United Nations in formulating and implementing its global policies on crime prevention and offender treatment. UNAFEI attends the annual sessions of the Commission on Crime Prevention and Criminal Justice [hereinafter Commission], a functional committee of the Economic and Social Council, every year and reports its activities and research findings. UNAFEI is also actively involved in the United Nations Congress on Crime Prevention and Criminal Justice [hereinafter Congress], a United Nations conference held once every five years, and has co-ordinated one of its Workshops at each Congress since the Tenth. The Commission, consisting of 40 Member States including Japan, is a functional committee of the Economic and Social Council and is the central body within the United Nations system providing policy guidance on crime prevention and criminal justice. According to the General Assembly Resolution "Creation of an effective United Nations crime prevention and criminal justice programme" (A/RES/46/152, adopted Dec. 18, 1991), UNAFEI is one of the United Nations institutes comprising the United Nations Crime Prevention and Criminal Justice Programme Network (a so-called Programme Network Institute [hereinafter PNI]), and as such, is required to keep the Commission informed of its programme of work and its implementation. 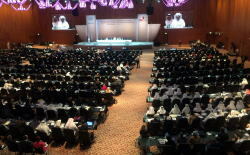 Accordingly, UNAFEI attends the annual sessions of the Commission, independent of the Japanese government delegation. 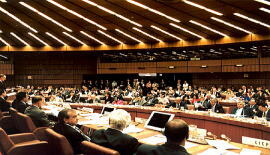 The 19th session of the Commission on Crime Prevention and Criminal Justice, convened in May 2010 at the Vienna International Centre of the United Nations, deliberated the following agenda. Item 3. Thematic discussion on protection against illicit trafficking in cultural property. (e) Other activities in support of the work of the United Nations Office on Drugs and Crime, in particular activities of the United Nations crime prevention and criminal justice programme network, non-governmental organizations and other bodies. Item 5. World crime trends and emerging issues and responses in the field of crime prevention and criminal justice. Item 6. Consideration of the conclusions and recommendations of the Twelfth United Nations Congress on Crime Prevention and Criminal Justice. Item 7. Use and application of United Nations standards and norms in crime prevention and criminal justice. (1) a summary of UNAFEI's 2009 Annual Report, submitted to the United Nations in accordance with the agreement between the Japanese government and the UN, was included in the "Report of the Secretary-General on the activities of the institutes of the United Nations Crime Prevention and Criminal Justice Programme network" (E/CN.15/2010/10) distributed at the conference. (2) the Director of UNAFEI made a statement about UNAFEI's contributions in promoting the UN priority issues in crime prevention and criminal justice. (3) the PNIs issued a joint statement that emphasized the roles and significance of PNI members, including UNAFEI. The Director of UNAFEI gave a statement at the plenary meeting of the Commission.The following is a summary of his speech.To see the Director's statement, click here. 1) UNAFEI, in selecting the themes for its international training courses and seminars, pays due attention to the priority areas of the United Nations Crime Prevention and Criminal Justice Programme. As a result, major recent activities of UNAFEI have covered almost all the agenda items of this Congress and its workshop themes. UNAFEI has thus contributed to the promotion and dissemination of UN policies on crime prevention and criminal justice. 2) At the Twelfth Congress, UNAFEI organized a workshop on Strategies and Best Practices against Overcrowding in Correctional Facilities. UNAFEI brought together leading world experts as presenters and panellists and, instead of simply focusing on causes and counter measures within the prison setting, adopted a practice-oriented, comprehensive, and integrated approach, addressing possible efforts that can be taken at all stages of the criminal justice process. I am certain that the discussions and the resulting recommendations will be an important milestone on the road to the resolution of this significant problem. 3) UNAFEI is determined to continue with its efforts to promote and enhance the crime prevention and criminal justice policies of the United Nations, in close co-operation with UNODC and our PNI colleagues. According to the discussions held during the 19th Commission, members of the PNIs resolved to make a joint statement under the item 4(e) as the PNIs, to broadly announce their activities to each government delegation that attended the Commission meeting. The draft of the statement was made after a deliberation. 1) The PNIs consist of UNODC and 16 other institutes from around the world who became members between 1962 and 2007 (UNAFEI, the oldest affiliated institute of the PNIs, is regarded as a leading member in the Report of the UN Secretary General mentioned in point (1) above). 2) The PNI member institutes provide a variety of services, including exchange of information, research, and technical assistance, such as capacity building, in order to strengthen international co-operation and to assist the international community in the crucial area of crime prevention and criminal justice. 3) The member institutes contribute to dissemination of UN standards and norms in crime prevention and criminal justice and other relevant instruments and activities: i) through research and technical assistance programmes, the institutes respond to the requests of governments in their respective regions such as for assistance in capacity building; ii) in collaboration with UNODC, the institutes work on data collection and analysis, and the development of tools and training materials; iii) contribute to the administration of the Commission, especially in preparing workshops on the substantive themes of the session; and iv) through support in planning, preparing and convening official workshops of the Congress, the institutes are contributing to the administration of the Congresses. To see the PNI statement, click here. The member institutes of the PNIs also resolved to make a joint statement as the PNI regarding Item 6: "Consideration of the conclusions and recommendations of the Twelfth United Nations Congress on Crime Prevention and Criminal Justice" through deliberations among PNI member institutes during the 19th Session of the Commission. The draft of the statement was discussed and decided. In this statement, the member institutes of the PNIs welcomed Item 9 of the Salvador Declaration, the accomplishment of the above-mentioned Twelfth Congress. In particular, the following description of Item 9 is highly appreciated: "We strongly recommend the allocation of sufficient human and financial resources to develop and implement effective policies, programmes and training dealing with crime prevention, criminal justice and the prevention of terrorism. In this regard, we stress the serious need to provide the United Nations Office on Drugs and Crime with a level of resources commensurate with its mandate. 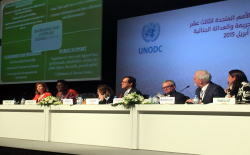 We call on Member States and other international donors to support, and coordinate with, the United Nations Office on Drugs and Crime, including its regional and country offices, the institutes of the United Nations crime prevention and criminal justice programme network and requesting States in the provision of technical assistance to strengthen their capacity to prevent crime." To see the statement, click here. The 19th session of the Commission adopted a total of 15 (draft) resolutions/decisions. (click here for the full text of the documents). All of the draft resolutions/decisions (A, B, and C below) were adopted by the Economic and Social Council at its session on July 22, 2010. 1) Draft resolution I: Strengthening crime prevention and criminal justice responses to violence against women "Violence against women"